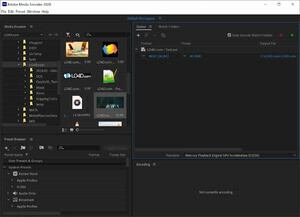 Adobe Media Encoder is a freeware video encoder offered by Adobe to compliment their other products such as Adobe Premiere Pro and Adobe After Effects. The application itself, however, can be used as a standalone video encoder tool which was designed especially for use with different screen sizes, formats and resolutions. Adobe Media Encoder CC is certainly a useful application to have if you're thinking of uploading videos and media to sites like YouTube or Vimeo. Despite being an Adobe product, it's very easy-to-use and provides a number of different presets. Version CC 2018 13.0.2 is a freeware program which does not have restrictions and it's free so it doesn't cost anything. For security reasons, you should also check out the Adobe Media Encoder download at LO4D.com which includes virus and malware tests. Additional screenshots of this application download may be available, too.